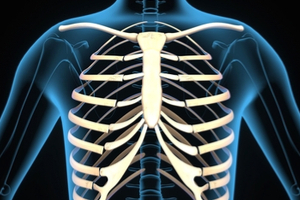 What is a Sternum X-Ray? The sternum, or breastbone, is a flat bone at the front center of the chest. The ribs and sternum make up what is called the “ribcage”. Sternum is attached to the first seven ribs and also to the clavicle, or collarbone. Your doctor can likely determine whether you have a bruised sternum by giving you a physical exam. They’ll check for signs of bruising, such as swelling or discoloration. You may also need a chest X-ray to make sure you don’t have a sternal fracture.